Matzitzah | "SAY WHAT LENA!!!???" 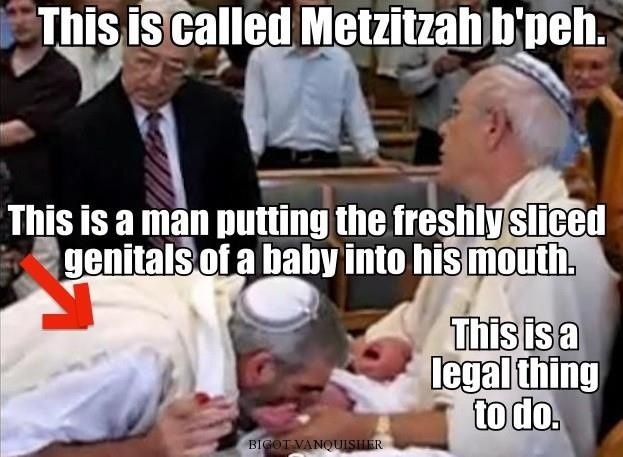 A Jewish newborn in New York has contracted the Herpes virus after undergoing metzitzah b’peh, a controversial practice in which a ritual circumciser applies direct oral suction to a baby’s still open circumcision wound, according to both the Jewish Daily Forward and the Jewish Week newspapers. The papers quoted health officials as confirming the case, which the Forward cited as the second recorded one this year. The New York City Department of Health and Mental Hygiene instituted a requirement that all parents allowing their children to undergo the procedure, which has come under fire from some sectors of the orthodox community, must sign an informed consent waiver. The parents of the child in question reportedly did not sign such a form. As early as the late nineteen century, Orthodox legal scholars have ruled that it is permissible to perform the suction by means of a glass tube rather than by applying direct oral suction. However, the practice is still maintained unchanged within certain ultra-orthodox communities.